A Day Late and A Dollar Short: snapfish - **FREE** Shipping and 30% Off All Cards! snapfish - **FREE** Shipping and 30% Off All Cards! Your holiday card shares your joy with loved ones once a year, so create one now from the most beautiful designs of the season. 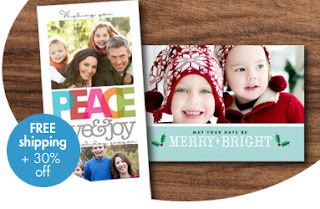 Get free standard shipping plus 30% off all cards when you use coupon CARDS30FS at checkout by November 22. Visit the snapfish website to get started! Enjoy and happy creating!